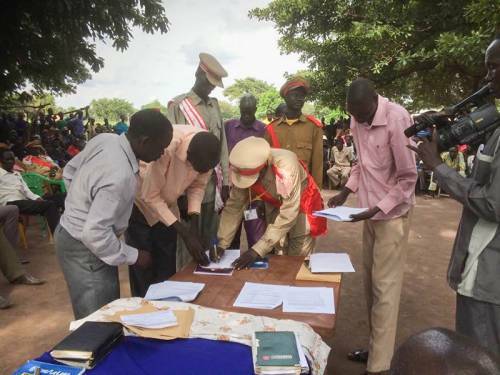 JUBA, South Sudan — When soldiers are seeking to reclaim lost territory they have little regard for the peace agreements signed by their national leaders. That’s why the grassroots work of the Rev. Peter Tibi and PC(USA) partner RECONCILE is a critical component of South Sudan’s fragile peace process. “Without the ongoing efforts at the grassroots level, the agreement is worth no more than the paper on which it was written,” he said. Tibi is the executive director of RECONCILE, which was created by the New South Sudan Council of Churches to bring peace and healing to communities hurting from decades of war. The Reconcile Peace Institute (RPI), one of three RECONCILE programs, brings leaders to the campus in Yei from around the country and strengthens their skills in resolving conflicts and recovering from trauma. Mission co-worker Shelvis Smith-Mather is the principal of RPI. But RECONCILE staff also go into communities affected by violence and mediate peace agreements, facilitate trauma healing as well as teach civic education, good governance, democracy and conflict transformation. Tibi, along with community leaders, government officials and representatives from the United Nations, recently met with five clans in Douncy County, Gok State, South Sudan to end hostilities and begin the process of reconciliation. The clans have a history of conflict over cattle raiding, water sharing and revenge killings. They collectively took an oath to tell the truth, accept wrongdoing, apologize and commit to reconciliation and co-existence. The death perpetrated by both sides numbers in the tens of thousands. But this time soldiers wore signs around their necks that they had surrendered their weapons. 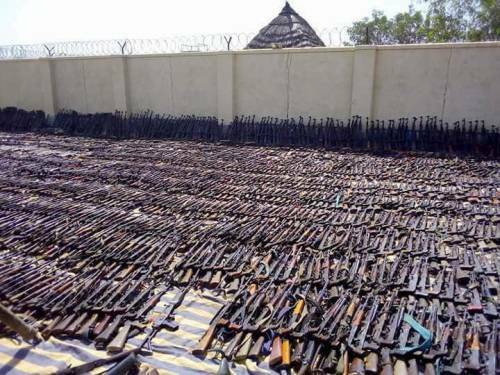 The guns were carefully placed on the ground in staggering numbers. Another peace deal was signed by South Sudan’s president Salva Kiir and rebel and former vice president Riek Makar on Wednesday, June 27 in Ethiopia. This is not the first time they’ve come to the table together. Peace deals signed by both leaders have fallen apart in the past. Under the threat of international sanctions, Kiir and Makar also signed a peace agreement in August 2015. Machar returned to Juba in April 2016 and was sworn in as vice president. Just three months later, violence broke out again between the two factions. Both sides blamed the other for violating the ceasefire. As if the violence was not enough, the people of South Sudan are threatened with an epic, man-made famine. Opposing forces more often target civilians rather than one another. In South Sudan, they have raided cattle and burned homes and fields. Because so many have been forced to flee people cannot plant crops or must abandon them. Estimates are that thousands face immediate starvation and more than one million are in danger. Last December, Tibi traveled to the same area to meet with the clans to prepare for upcoming reconciliation talks, bringing together women’s groups and youth camp leaders, as well as chiefs and commissioners. “Reverend, you came in peace and you will go in peace,” they told him, even offering traditional blessings, but fighting broke out in a neighboring community and Tibi left in an armored convoy to travel to the air stip. His vehicle made it safely through a village that had just been burned to the ground. The convoy was fired on and some people died. He made it safely back to Juba and the government declared a state of emergency and forced disarmament followed. The South Sudan Education and Peacebuilding Project partners with RECONCILE in peacebuilding activities and longtime PC(USA) partners, the Presbyterian Church of South Sudan and Across, to train teachers and strengthen Presbyterian schools including those in Pochalla and Pibor, two rural and inaccessible areas of the country. In Pibor, about 90 percent of children never finish elementary school and some children have never attended school or known peace in their lifetime. In South Sudan, the UN reports that a girl is more likely to die in childbirth than finish primary school. Mission co-worker Leisa Wagstaff has been going to rural areas and even traveling to the refugee camps to help teachers gain the necessary skills to help children heal from a lifetime of trauma. In a recent two-day gathering, a program of the Presbyterian Church of South Sudan’s Education Department provided activities for children to participate in trauma healing. “We laughed, played, shed tears, journeying through some painful remembrances and harsh realities and celebrated the promises that God has given us,” she said. During the training, each participant was asked to think of a very painful memory. They talked freely about the killing of relatives, homes being torched, lack of education and facing the fact they may have no future. 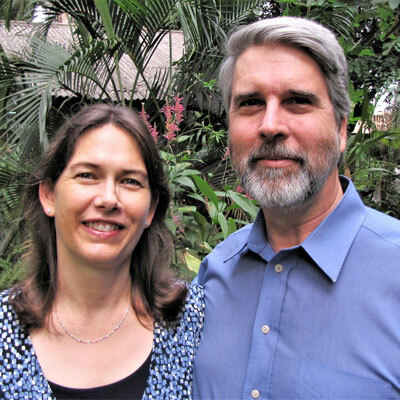 The 223rd General Assembly (2018) of the Presbyterian Church (U.S.A.) passed a comprehensive overture on South Sudan which provides our Office of Public Witness in Washington and United Nations office in New York with a strong foundation for advocacy and encourages our congregations to accompany advocacy with prayers and support. To support the South Sudan Education and Peace Building Project, click on https://www.presbyterianmission.org/donate/e052172-1/.